Job Quality: Are you satisfied at work? Work-life balance (including whether there is a wish to work shorter hours). It is suggested that the above measures are added to the government’s annual Labour Force Survey (“LFS”) from 2019 so that the necessary data is collected. It limits its recommendation to 18 questions concerning the above topics but goes on to detail 14 additional job quality measures which it suggests should be added in future. These additional measures include the types of benefits that the employer provides, whether the employer takes health and wellbeing issues seriously, whether work related training has been offered, the flexible working arrangements on offer (both formally and informally), the suitability of working hours to fit with family and social commitments and the impact of work anxiety during personal time. Clearly these additional questions are wide-reaching and demonstrate that nowadays employers are perhaps expected to be giving much more thought to employee job satisfaction and quality of work life balance. The recommendations in the report follow on from the Taylor Review of Modern Working Practices in the UK which was published last Summer and which highlighted that the “quality of work in the British economy” should be better evaluated. It remains to be seen what, if anything, is taken forward. Measuring good work matters. The UK current performs strongly on job creation, with each record low unemployment statistic celebrated in the national media. But why do we not have any similar measures for understanding quality of work and how we can make work better? 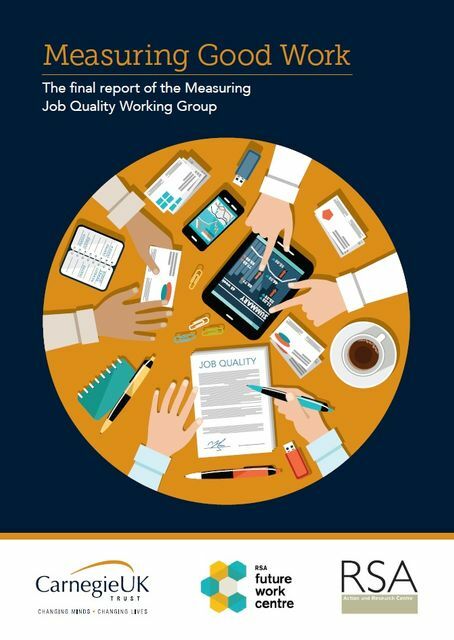 The Carnegie UK Trust-RSA Working Group on Measuring Job Quality has brought together representatives from across trade unions, industry, charities and academia to consider the practical challenges of implementing national job quality measurement in the UK. Responding directly to the recommendation of Matthew Taylor’s Modern Employment Review and the ambition of the UK Government’s Good Work Plan, the report presents a measurement framework for tracking progress towards the outcome of good work for all.